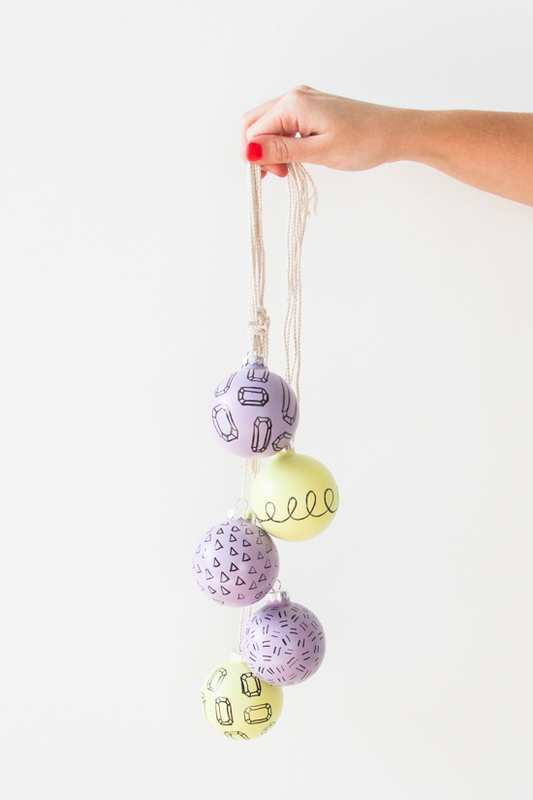 Remember that DIY Easter eggs project I did earlier this year, with permanent markers? Well, I happen to have a few extra ornaments lying around this year, so I thought I’d turn them into a Christmas version of the Easter eggs, for fun. 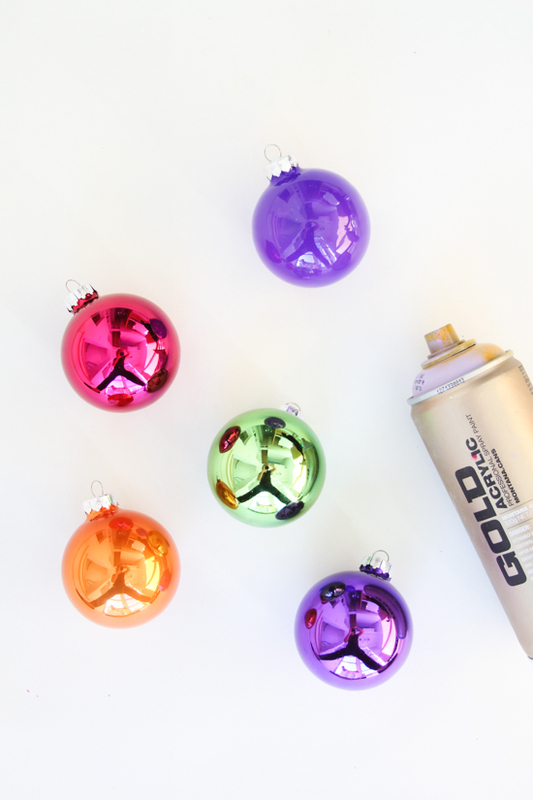 Grab some basic round ornaments and your favorite (flat finish) spray paint, then head outside to spray paint these puppies up. Before you spray paint, be sure to remove the metal hooks from each one, popped a popsicle stick in each one, then turned ’em upside down and stuck the popsicles sticks into the styrofoam to keep them semi-still while spray painting. Once painted, give them a good amount of time to dry to the touch. If they’re drying in the sun it really shouldn’t take more than 10 to 15 minutes for them to be completely dry. Then, grab a black permanent marker and draw little designs on each one: gemstones, triangles, hatch marks, squiggles, etc. Pop the metal hooks back on, add a string, and they’re ready to hang. 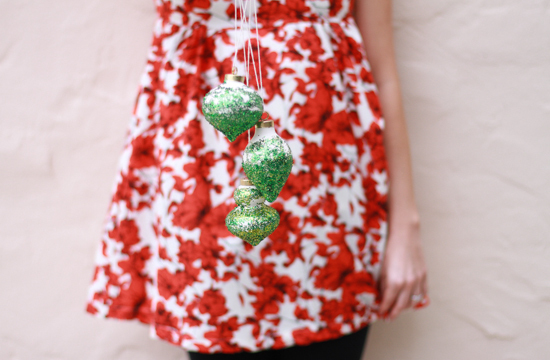 Have any plans for last minute holiday DIYs before Christmas rolls around next week? 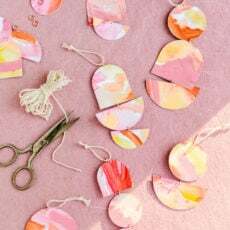 You are a wellspring of creativity, girl! 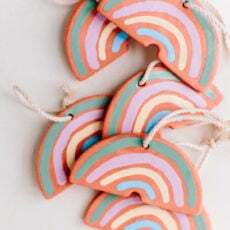 Love these…and the idea of Christmas ornaments in a nice pastel hue. These projects are always some of my faves of yours! Loved the eggs, love these! So simple and perfect for getting done this weekend. I want a gem one!! Oh I love these Brittni! Since my brother is turning 18 and moving out of the house and I’ll be on my way to sunny California soon, my mother has decided this is the year we’re divvying up our Christmas ornaments. Most of them are from our childhood, and the ones our grandparents give us every year. 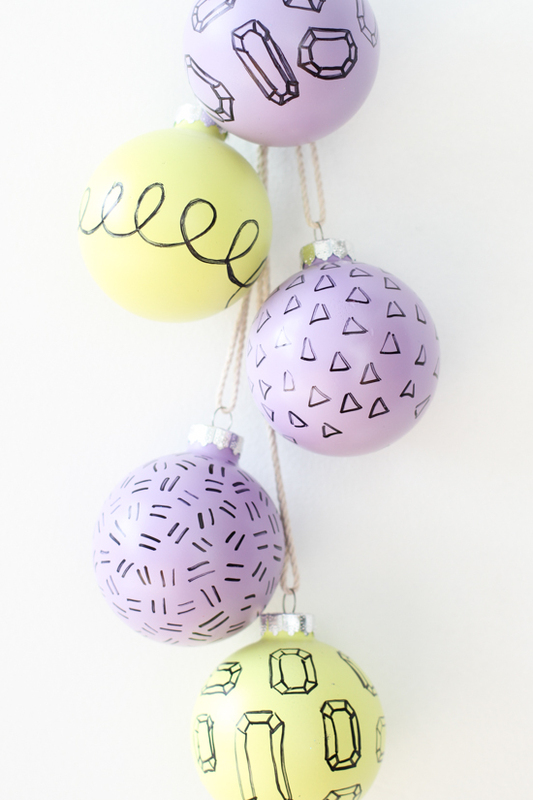 I think I’ll have to take this DIY and supplement the ornaments I get to take with me.